The Felibrige, a literary association founded on the 21st of May 1854. 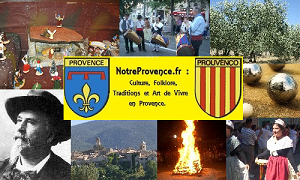 The « Felibrige » is a literary association founded on the 21st of May 1854 by seven young Provençal friends in Font-Segugne castle 1. The aim of the association was clearly defined from its onset, i.e. to create a gathering of selected and serious minds able and willing to restore the Provençal tongue and literature away from the quick and coarse troubadours. In order to distance themselves from the other Provençal poets whom they considered as unremarkable and vulgar the seven friends decided on a unique name, the ”Felibrige”. It originates in an old song “Saint Anselme’s Oration”, brought by Mistral, where it is written: “…with the seven doctors of the Law, with the seven Felibres of the Law…”. Since they too were seven and intended to embody the new law of poetry they were the doctors of the law, “Felibres”. It is in the castle of Font-Segune that the Felibrige was created. First and utmost there was Joseph Roumanille, real father of the Felibrige and Mistral’s mate. With these two Theodore Aubanel will be the third pillar of the Felibrige. One should also mention Anselme Mathieu who was Mistral”s companion in poetry since high school. The other Felibre were Jean Brunet, Paul Giera and Alphonse Tavan. Although the official date of the creation of the Felibrige was May 21st, 1854 some felibres had not waited to begin acting towards the recognition of the Provençal language. Joseph Roumanille will be the most active in bringing all of them together. To do so he closely followed two examples: that of a Celtic poet, Brizieux, who was militating for Brittany in French and mostly that of Jasmin who was writing in Gascon. As from 1850, Roumanille, who had taken part in various attempts associative gatherings that turned out to be failures because of the poor quality of the concerned authors, undertakes a gathering of Provençal poets with a view to revive and purify the Provençal tongue. In 1852 he succeeds in publishing “Li Prouvençalo” a collective compendium in which first appear the literary principals of the future new Provençale poetry. All the Langue d’Oc authors can be fount, but the outstanding ones are those who will become the future “Felibres”, particularly Roumanille, Aubanel and one Mistral already designated as the basic poet of the future Provençal poetry. This book was rather successful although some of the contributors disliked the new spelling. However it made Roumanille realise that aspects of grammar and spelling required standardization. Roumanille organised a meeting of all the Provençal poets in Arles on the 29th of August 1852. This meeting, then called Roumavàgi, appeared satisfactory and it was decided to meet again the following year. But things changed in 1853. Mistral, Aubanel, Roumanille read their verses in Provençal but it was mainly a young peasant, Alphonse Tavan, future felibre who drew the attention. During this second “Roumavàgi” no agreement on spelling between natives of Marseille and Avignon could be arrived at. Those from Marseille wanted full control! Therefore they all broke up and went home swearing never to attend such a meeting again. Roumanille and his friends from Avignon realised that they had better work separately, away from the other Provençal poets, more particularly those from Marseille. After several meetings first in Giera’s home then in the summer home of Font-Segugne they decide to found a new association in support of the Provençal new poetry. The Felibrige then fixed its objectives which were to restore the Provençal tongue by giving it back a grammar and a spelling that had been lost by long centuries of neglect. The Felibres soon came to realise that producing beautiful poetry and an expurgated language would not be enough, there was a need to communicate with the common people to instil again the values of that language. In order to do so and following an idea of Roumanille the Felibre developed a non-profitable vector of propaganda; the “Armana Prouvençau. This Almanac entirely written in Provençal informed of the celebrations and gatherings to come and most of all contained a history of Provence so as to educate people in their past and introduce them to local literature. Five hundred copies of the first almanac were printed in 1855. During the early years of the almanac the felibres only contributed under pseudonyms: Mistral was the felibre of “Bello-Visto” (the name of a farm he owned), Roumanille was the felibre of the “jardin” (his father was a gardener in St Remy), Aubanel was the felibre of “Miougrano”(pomegranate, from the title of one of his poems), Jean Brunet that of the “Arc de Seddo” (rainbow, alluding to his profession as painter), Giéra was the “ajougui” (jovial) and Alphonse Tavan the felibre of the ‘Armado” (he took part in the military campaign for Rome). For fifty years Mistral and Roumanille got down to producing this almanac, setting the foundations of the new Provençal spelling in doing so. Before them spelling was in total chaos as no consensus could be found between the various authors. Therefore both rejected the etymological spelling in favour of a phonetic approach. They also adopted an accentuation system such as the tonic accent to show the syllable the pronunciation of which should be emphasized. Another rule introduced diphthongs and triphtongs allowing for the aggregation of successive vowels all of which should be pronounced (see elsewhere about pronunciation). The system was appealing by its clarity and simplicity and was soon adopted by all of the felibres’ friends although some unrepentant believers in the old system remained hostile to the new spelling. First this almanac helped in spreading the new course of Provençale poetry then to announce the new works of the felibres. Since its first edition in 1855 the “ Armana Provençau” has enjoyed a large success. Written by Mistral the Coupo is not only the anthem of the Felibrige but that of the whole of Mistral’s Provence. As early as 1854 the Felibrige also adopted an emblem which is the seven-pointed star. The very Mistral told how thi star became the emblem of the Felibriges: “ The first meeting of the Felibres took place in Font-Segune on May 21st, 1854 and we were wondering what our emblem could be when, looking at the calendar, one of us noticed that it was Saint Estelle name’s day. That is how Estelle became our patron-saint and since in Provençal Estello means star we made it our symbol to govern the destiny of the Felibrige”. To date the Felibrige continues the action of the initial seven Felibres and meets at least once a year on Saint Estelle name’s day in different towns of the langue d’oc region.